This dip was another Festivus miracle. So yummy - it virtually disappeared from the table. It was very easy to make, and preparing it in a bread bowl really took the presentation up a notch. This recipe also hails from Karly Campbell over at buns in my oven. It's a good thing we spell our names differently, or it could get really confusing. She's a great resource for yummy, easy, sinful party food - one of the first places I look for ideas when planning a menu. This dip really was good. As it should be, since it contains some of the usual suspects: cheese and bacon. If you're hosting a New Year's Eve party, this would be a great addition! You might even consider doubling it. We only had 12 people for Festivus, and we could have easily handled an extra round of this dip. Slice the top quarter off the loaf of bread and set aside. Carefully hollow out the inside, leaving a 1 inch shell. Cube or tear removed bread and set aside for dipping. 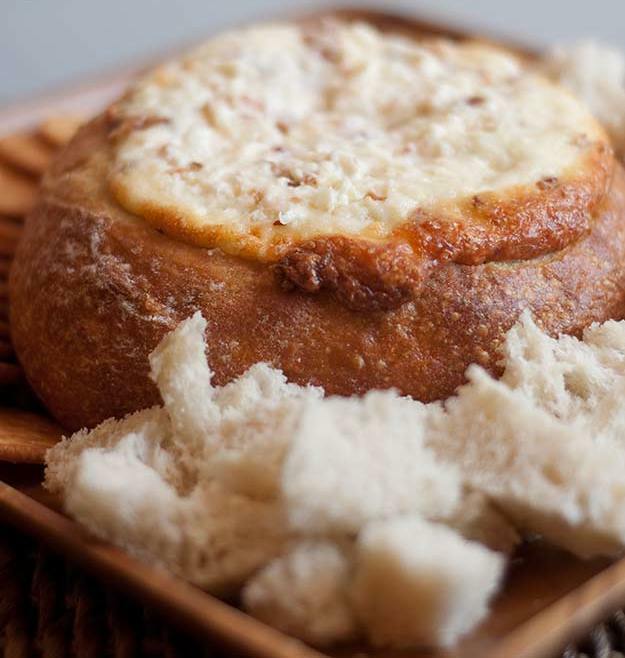 Combine remaining ingredients thoroughly in a large bowl (it will seem pretty thick); spoon into bread bowl. Place on an ungreased baking sheet and cover with the reserved top quarter of the loaf to prevent the dip from becoming too brown while baking. Bake until heated through, 45 minutes to an hour. Serve with bread cubes and crackers (Ritz or Wheat Thins are my favorite).